This year, Bowman Heritage pays tribute to one of the most beloved baseball sets ever created � 1955 Bowman. From its unique "Color TV" design to its Umpire cards, 1955 Bowman is an absolute classic and Topps has recreated the magic for today�s enthusiast in 2004 Bowman Heritage. Whether you build sets, collect rookie cards, chase autographed and relic cards or just enjoy everything about collecting baseball cards, Bowman Heritage is the set to have. The 350-card base set features 170 Veterans, 100 Rookies, 10 Retired Greats from the original set, 20 of today�s Umpires and 50 Short Printed veteran and rookie cards (inserted 1:3). And for the first time in any Heritage line, there will be a redemption card for a unique collectible binder. 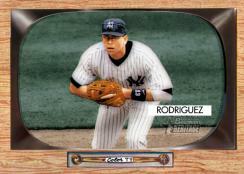 Topps has teamed with M.J. Roop Archivers (www.mjroop.com) to offer collectors the exclusive Bowman Heritage Binder. It�s the perfect touch for the set builder! There are also 3 parallel versions of the base set�Black & White TV (1 per pack), Mahogany (#�d to 25) and 1 of 1 Printing Plates. There are 1400 Printing Plates in all. 2004 Bowman Heritage features 3 autograph programs � "Signs of Greatness" focuses on 12 future stars such as 2004 first overall pick Matt Bush. "Signs of Glory" includes 5 signers from the original set and the 20 Umpires have penned their signatures in "Signs of Authority". There�s also a 1 of 1 cut signature featuring 1955 MLB Commissioner Ford Frick. And for Relics, 2004 Bowman Heritage offers 80 different MLB stars such as Albert Pujols, Adrian Beltre, A-Rod, Sammy Sosa and many more in "Threads of Greatness". There is also a gold version #�d to 55. In all, each box guarantees ONE Autograph and TWO Relics. Each 8-card pack carries a $3.00 SRP and hits hobby shelves December 22nd.